Leverage the power of Businessobjects and Tableau. InfoBurst Tab bridges that gap between Businessobjects Reports, Universes, and Tableau dashboards. Event Based Scheduling – Automated Scheduling of Tableau Hyper extracts based on database triggers, ETL schedules and file presence events. Avoid recreating Tableau Calculated fields – Dazzle your Tableau Dashboards by leveraging Complex formulas and variables defined in Universes and Web Intelligence Reports. Export Tableau Dashboard images – Intelligently email tableau dashboard images in PDF or PNG format. Render Tableau dashboard images in Sharepoint or InfoBurst portal. Includes a powerful macro builder that can use original file name, filters, date, time to dynamically name TDE’s and Hyper files something meaningful to the user. InfoBurst has a rich array of distribution options and can provide an automated way for Tableau desktop users to distribute their dashboards with or without Tableau server. You can also check out Paul’s blog post on InfoBurst Tab! Leverage an SAP BusinessObjects Web Intelligence report with Tableau. Use InfoBurst to schedule and publish a Tableau Data Source in Hyper format to a number of destinations: Tableau Server, Tableau Online, Network Share, SharePoint, and more! 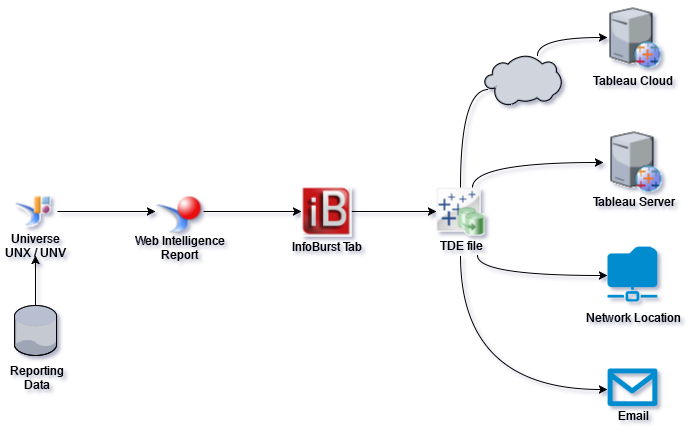 Burst a Tableau Workbook based on an SAP BusinessObjects Web Intelligence Report. The TWBX files created by this process can be published to Tableau Server, Email, a Network Share or SharePoint. This video shows the Tableau Server and Email distribution options. And now Introducing InfoBurst Tab for Tableau Users ! Learn More.. Please can you advise if InfoBurst Tab can use other query types instead of unv/unx e.g. BEx queries? We will have an answer for you shortly. Thanks for your question! I will have an account manager follow up with you. I will have an account manager follow up with you shortly.